November 19, 2018 – The Atlantic City Boxing Hall of Fame (ACBHOF) has announced its 2019 Induction Class. The Induction Weekend will take place at The Claridge, a Radisson Hotel located at Park Place & Boardwalk in Atlantic City, New Jersey on June 21 – 23, 2019. “We’re extremely excited about the Class of 2019 and are very much looking forward to paying tribute to the new inductees in Atlantic City at our 3rd annual induction weekend next June” said ACBHOF President and Founder Ray McCline. 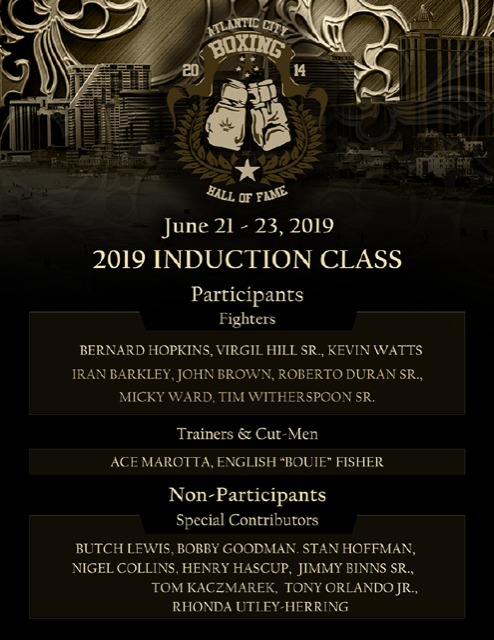 Bernard Hopkins Tim Witherspoon, Sr.
Kevin Watts Virgil Hill, Sr.
Henry Hascup Jimmy Binns Sr.
Tom Kaczmarek Tony Orlando Jr.
Bernard Hopkins will be inducted into his first Hall of Fame as part of the third annual class that will include a total of 19 inductees. “I feel appreciated and it’s starting to settle in that I’m near that mark of living legend. I don’t see myself as a living legend. Let other people decide that. This is a great honor and I’m grateful for the Atlantic City Boxing Hall of Fame for making this happen,” Hopkins said in a November 16 RingTV interview with Joseph Santoliquito. The 3rd Annual Induction Ceremony & Celebration Weekend will honor some of the world’s most iconic figures from the sport of boxing: Butch Lewis, Nigel Collins, English “Bouie” Fisher and New Jersey Boxing Hall of Fame’s President Henry Hascup are just a few named who will be enshrined with the 2019 induction class. Inductees will be named in three categories: Fighter, Trainer & Cut-Men and Special Contributors.